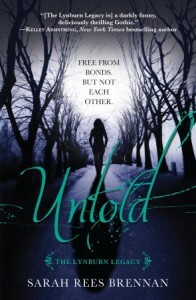 After the heartbreaking ending of Unspoken I thought that I was ready for Untold over a year after I read the first book. In the beginning of the book I barely remembered what happened in the last book. I only really remembered the major stuff, like Kami breaking the link with Jared, but aside from that I was kind of lost and a little worried that I wouldn't enjoy this book as much as the first one. Thankfully in the beginning there were little reminders of the events that took place in the previous book that were extremely helpful and perfectly timed. I completely adore the characters and I went through this book with a smile on my face (for the most part) because the characters are extremely witty and sarcastic. Yes there were a few cringe worthy lines because they were really cheesy, but those were overshadowed by the brilliant remarks of Kami and her friends. The major complaint I have about this book is that it takes forever for the plot to get going. Most of the book focuses on the characters and while I love the characters and how they developed, I feel like there was too much emphasis on them and not enough on the actual plot. Until over halfway through the book, it is mostly Kami calling meetings with her friends where practically nothing gets done combined with an overload of angst. Character development is extremely important to me, but there is also only so much angst I can take and that is why this book did not get five stars. "Every dark moment you ever had in your life," Jared said. "Every time you were a kid hiding under the covers convinced that nobody in the world existed, that it was just you and the nightmares. Every time you felt alone in a crowd, alone by yourself, forever and essentially alone, and don't pretend there weren't moments like that. Every time you felt worthless, every time you thought there was no purpose to existing, no center to the world and no peace to be found. I never had a single moment like that, I was never lonely a day in my life, until now." That quote perfectly explains Jared and even Kami's behavior. They now will have these feelings and doubt themselves because they don't have each other to tell them that they shouldn't be doubting themselves and feeling so alone. Most people learn to deal with feeling alone because they have to, but Kami and Jared never learned this essential skill because they didn't have to. There was another quote that I can't find, but I believe Jared said while trying to explain the feeling to Ash and he said that it was like asking a fish about water (or something like that). There was also a love triangle, but it wasn't all that bad because all the characters involved are three dimensional and not just there to create drama. It's also really obvious how the characters actually feel even if they won't admit it. Probably the best side character is Angela because I feel like she really developed as character. Angela is dealing with her fallout with Holly after she tried to kiss her friend because she thought that Holly also liked her. Throughout the book, Angela is trying to work out how to come out as a lesbian and fix her relationship with Holly. It's a really great addition to the story because the way it is handled is believable. I already bought the next book, so I'll be starting that as soon as I have the time.